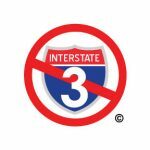 Will Interstate 3 help your county? It depends on your county’s classification. Adjacent counties: Counties relatively close to counties with interstates, but located off the interstate. The effect of interstate highways on competitive counties (the counties with cities of more than 25,000) are generally positive. One adverse effect is a statistically significant, negative residential adjustment difference which occur upon the completion of interstate routes: net commuter inflow is stimulated. Many of the sectors that exhibit negative mean growth differences for competitive counties are positively affected in the urban spillover counties. What that means is that when the highway was finished, a significant amount of people wanted to move away from the interstate and moved to a spillover county and started to commute further to work (the sprawl spreads!). Urban spillover counties show the most profound and sustained positive effect as far as income and population growth. The uncompetitive counties, those without a city of 25,000 or near a metropolitan area, exhibit little effect on total income or earning. What little growth occurs stems from three sources: First, income categories such as transfer payments and dividends, interest, and rent exhibit positive and often statistically significant effects. These results suggest that uncompetitive counties become more attractive for retirees, vacationers, and perhaps, commuters. Second, retail trade grows faster for uncompetitive counties, but at a much smaller magnitude than for competitive and spillover counties. This pattern – and the absence of similar positive impacts in services and state and local government – suggest that, instead of the dynamic competitive advantages which resulted in sustained tertiary-sector-improvement for competitive and spillover counties, the effect for uncompetitive counties may be limited to highway- related retail outlets like gas stations and grocery stores. Third, the performance of some sectors appears to bear a slight resemblance to urban spillover counties. For instance, manufacturing has about the same timing and follows the same trajectories. It begins when impacts peak for the competitive group, suggesting that the same locational forces that result in diffusion from the competitive core may later push these industries into the more remote periphery. However, these differences never become statistically significant, even in later years. Adjacent counties located in close proximity to interstate counties show many negative effects. Included are population, services, and state and local government sectors. Retail trade exhibits statistically significant negative effects during four intermediate years. To sum this up: Interstate 3 could possibly help your county if you fall into the right county classification above. Your county needs to be in a metropolitan or urban spillover area to really gain the benefits of a new interstate. On the other hand, the only thing worse than being a rural county with an interstate is being a rural county with an interstate 10 or 20 miles away. My county? We would lose with I-3!